Americans take for granted their rights as citizens, but not all countries give their citizens such rights through a democratic system or a written constitution. One such country, India, has grouped the Indian citizens into castes since ancient times based on the beliefs of the Hinduism religion. The word “caste” is taken from the Portuguese word, “casta” which means “race” and all citizens are born into one of multiple caste groups. (Shouler, 157) These castes will determine the quality of life for an Indian person, who they may marry and will mark them permanently until their earthly walk comes to an end. The caste system consists of four named groups and one group which had no formal name but the people are referred to as “untouchables” placing them at the very bottom of civilization. The four castes were based on parts of the body, the Brahmins (mouth), Kshatriyas (arms), Vaishyas (thighs), and Sudras (feet). (SarDesai, 105) A brief explanation of these groups will follow before moving on to the caste referred to as untouchable. The Brahmin caste was the “dominant group, the very model of the Indian social hierarchy” (Deliege, 32) and the smallest of all in caste size. This group consisted of priests and academics, and the Verdic word brahman means prayer, which would be expressed through the mouth. The Kshatriya caste consisted of the warriors and kings and their responsibility was to protect and rule by use of their arms. This group wears sacred threads indicating they have been born twice, once physically and the second spiritually. (Shouler, 154) The Kshatriya caste and Brahmin caste often worked closely together in order to remain in control of the social order. The small size of the two castes would appear to put them in jeopardy, but the long tradition of Indian hierarchy and religion retains their high-seated positions. The third caste, named Vaishyas, is made up of merchants or agriculturalists. (Shouler, 155) This group is also referred to as the common people and mainly comprised of farmers. Their responsibility is to ensure there is food for the community and they are an important part of the Indian economy. The physical nature of their work reflects back to their depicted body part, the thighs. The last named caste of India, is the Shudras, portrayed as the feet. (Moraes, 7) This group was considered the lowest of all social groups because they are servants. They perform personal services for the castes above them and those services range from barbers, launderers, cooks, maids, gardeners, drivers and the like. (Kolanad, 157) The only tasks that did not fall to the Shudras were those that were found to be so undignified, it could only be performed by that of an untouchable. To be included in any one of the four castes places that person into an acceptable position within the Indian nation, all others fall into that of an untouchable, the lowest in society and not even considered to be part of humankind. The untouchables fall below the Shudra caste and were not given a formal caste name. These people were often foreigners, lawbreakers, people from isolated tribes and people stricken by disease. While the caste system was abolished after the fall of British rule in 1947, (Shouler, 156) and outlawed in the Indian Constitution in 1950, (Kolanad, 39) the inhumane treatment of those people continues today. The untouchables must live by a strict rules implemented by all castes above them, as well as by other untouchables. The untouchables have been given many names over time and also fall into sub-castes in India. There are a substantial number of people that fall into what is presently called the Dalits. There are approximately 150 million Dalits in India today. (Dowling, np) This number may be low because it is difficult in gathering accurate numbers when the citizens are embarrassed to reveal their caste name. These people are excluded from living in the villages, must dress in rags, eat only scraps and are degraded at all times. (Deliege, 12) The term Dalit is a euphemism for untouchable and the most common name used. When asked by Robert Deliege what caste an Indian is from, they would often refuse to give their caste name or instead replied, “What does it matter? After all we are human beings like you.” (14) While centuries have passed since the caste system was placed, the treatment of untouchables is still appalling to those of the West. In an attempt to be politically correct, three names have become widely used in place of the label untouchable. Those names are Harijan, Scheduled Caste and Dalits. Gandhi called the untouchables Harijans (blessed through suffering) and worked to see these people treated more humanely. In the past the untouchables deemed to have problems following Indian law were cruelly punished by being fed to wild dogs or burned to death on a “red hot iron bed.” (Flood 59, 60) Gandhi, who only desired a peaceful means of demonstrations in life found this treatment of human-beings unacceptable. In time, the untouchables began referring to themselves, when forced to give a caste name, as being a Dalit, meaning the oppressed people. Outsiders, generally scholars, choose to identify this group of Indians as Scheduled Caste. The untouchables can be found in any area of India. It is not limited to one region or state. Every village has untouchables who must do the “dirty work” that no other caste is held responsible in completing. These duties always have some tie to filth. (Deliege, 25) The untouchables must use buckets to clean out the toilets, remove waste and dead animals along the streets, clean the bodies of the dead, skin and tan the hides of animals, ward off evil spirits and provide menial tasks considered unclean for the higher castes of the community. This work is always hired out to untouchables to ensure the lives of India’s communities continue to run smoothly. The Dalits were also expected to follow the “unwritten rules” pertaining to their class of people. Dalits could not eat with members of other castes and they must have separate glasses for drinking and utensils for eating; (Moraes, 28) these examples of the expectations nearly make sense in a hygienic matter. Other laws, such as separate burial grounds, segregated classrooms and sub-standard wages (Shouler, 152) are rules enforced strictly to humiliate this class of people. Regardless of the modern era India has entered and the separation of religion and state, the caste traditions are still carried on by Indian citizens. The question today is: have the changes in the law that took place in 1950 made any changes in the lives of those deemed untouchable? Zinkin states, “Untouchability has disappeared because the Constitution makes the enforcement of it an offence. Everyone pretends that caste no longer matters because India is modern.” (177) This may be true in so much that the government no longer recognizes an organized caste system but the reality is the people of India continue the hierarchy tradition to present day. There are millions of untouchables in castes and sub-castes that are given names to cause insult and humiliation. Deliege listed only a few of those caste names, some being, Mala, Nadar, Pulayan, Paraiyar, Chamars, Bhangis and Mahars (21) that continue to lower an Indian to what is considered a non-human. It may seem as though India has not made much progress in freeing the people from being called non-human and living a life of degradation involving the filth of the community, but recently there has been relief as the Indian people have taken a Democratic approach to electing leaders. Gandhi had high hopes for the Dalits and is quoted as stating, “The country will attain the real freedom only on the day a Dalit would become the president of this country.” Gandhi’s life was cut short with his assassination in 1948, but had he lived, he would rejoice that the Indian people elected a Dalit to the presidency. 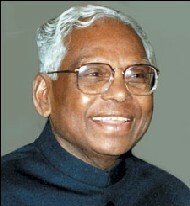 K. R. Narayanan served India as president from 1997 to 2002. (Dowling, np) This was no small victory for the enormous group of oppressed people and since the election of a Dalit to presidency, the lives of the untouchables has improved. Even with the laws passed against discrimination, those who are caste as Dalits remain low in the social order today and those fortunate enough to be born into the higher castes remain high in the social hierarchy despite the changes within India. While being born into a caste may seem to seal the fate of an Indian, there is the possibility of moving up in the caste system. “One’s birth determined one’s class, which could be altered only with rebirth, depending on one’s karma.” (SarDesai, 104) Based on this spiritual rebirth, an Indian may move up in the caste system as this person has pleased the gods and found worthy to transcend to a higher position in the community. This has been achieved by K. R. Narayanan and numerous other Indian citizens, thus deserving mention in this essay. Two former Dalits have risen from humble beginnings and shed the caste they were born into. Mayavati has overcome not only being born an untouchable, but is also a woman. She is the country’s most famous lower caste member, according to author Sreedhar Pillai. 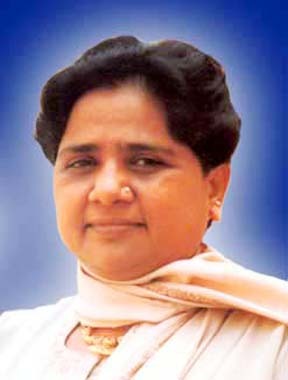 (np) This year, Mayavati was voted into a four year position of chief minister of Uttar Pradesh, the most populated state of India. She has become an icon for the Dalits that continue to remain in a state of degradation and aspires to one day be the Prime Minister of India. These are lofty goals for a female Dalit, but she has proven her worth and her attaining her stated goal is within the realm of possibility. A second Dalit that has risen above his birth caste is Hari Kishan Pippal. Pippal stated in an interview that “as far as he could remember, people told him he was unclean, with a filthiness that had tainted his family for centuries. Teachers forced him to sit apart from other students and employers did not bother to pay him.” (AP, np) Pippal was not expected to have higher goals in life beyond that his Dalit father, a stone cobbler. Refusing to be passed off as inhuman, Pippal pushed himself to strive for much more in life and despite those who wished to suppress him, at 60 years old, he has made remarkable achievements. He is the owner of a hospital, a shoe factory, a car dealership and a publishing company in India and proof that in this day and age, a person can escape the caste they are born into. The people who have broken out of the cycle of the caste system are rare and unique. Unfortunately, even with the changes in Indian government, the caste system is still a reality that Indian citizens must learn to live with and adapt to. If nothing else, the inspirational stories of these three people who have loosened the chains that bound them to the caste they were born into give other Dalits the hope for a brighter future. Gandhi predicted the rise of the Dalits out of the filth they have been held to for centuries and while it may take more centuries to end the persecution of these Indians, there is hope–if nothing else–and that is a start. Associated Press. I was one of India unclean Dalits, now I am a millionaire. The National News. 2011. Web. 28 Oct. 2013. Daniel, Ahron. 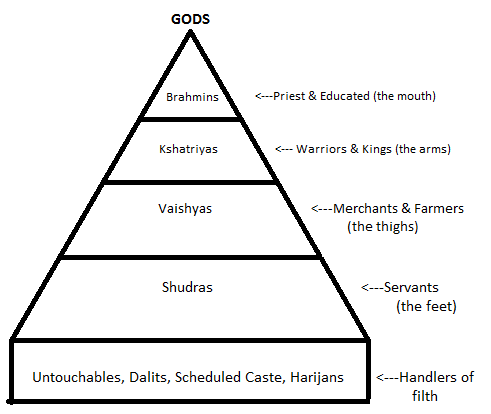 The Caste System in Modern India. tripod.com/modernindia. 1999. Web. 27 Oct. 2013. Deliege, Robert. The Untouchables of India. UK: Berg Publishers, 1999. Print. Dowling, Mike. “The Caste System at mrdowling.com”. http://www.mrdowling.com. 2013. Web. 27 Oct. 2013. Flood, Gavin. An Introduction to Hinduism. UK: Cambridge University Press, 1996. Print. Kolanad, Gitanjali. Culture Shock! India: A Guide to Customs and Etiquette. Oregon: Graphic Arts Center Publishing Company. 1994. Print. Moraes, Frank. India Today. New York: The Macmillian Company, 1960. Print. Pillai, Sreedhar. A Dalit Prime Minister. Ibnlive.in.com. 2013. Web. 28 Oct. 2013. SarDesai, D.R. India The Definitive History. Colorado: Westview Press, 2007. Print. Shoulder, Kenneth., Anthony, Susai. The Everything Hinduism Book. Massachusetts: F&W Media, 2009. Print. Zinkin, Taya. Challenges in India. London: Chatto and Windus Ltd., 1966. Print. The pictureof a pyramid shown is wrong. A pyramid does not have a mouth, arms, thighs ad legs. A human body or a God body does. The India holy books says a society should have a caste system based on function. If it is based on birth it is “adharmam” or irreligious. The problem with western intellectuals is that the western countries have a caste system based on birth – this is called racism. So they use the same pattern and apply to India. In India, the problem of caste system is solved by treating all castes with respect. It is non-sensical to claim that one has a society with no castes. I have never seen such a thing. As is demonstrated in the past and as is today, caste is not tied to birth. Mahatma Gandhi is a merchant by profession but he is the father of the nation. This can never be possible if India has a caste system based on birth.